When You Go To War, You Take Your Family With You. 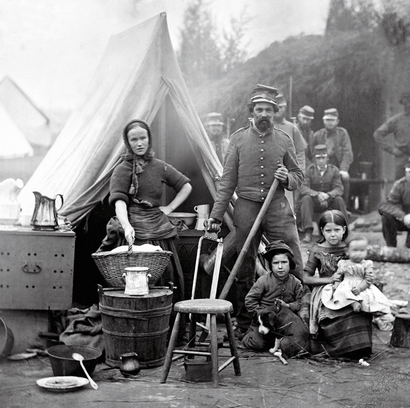 Today I saw a picture in Yahoo News taken of a family during the civil war. It’s meaning was powerful then, it still is today. America’s Civil War, whose 150th anniversary is marked on Tuesday, is so often described in battles — the Battle of Gettysburg, the Battle of Bull Run, the Battle of Fort Sumter — that it may be easy to forget that the soldiers who fought in the four-year war had a lot of time between fighting. The rare photos seen below document just that — the time soldiers spent waiting, preparing, recovering or just living. He points out that because of where camera technology was at the time, the in-between was much of what was photographed during the Civil War, since battle scene photos would often come out too blurry. The war marks one of the first times dead bodies were photographed. Another thing that comes out of some of the photos is a time truly left in the past, when family members and nearly entire towns would travel with the men to their battlegrounds. May we as Christian parents always remember, when we go to war against another brother or sister, we take our whole family with us! You are amazing and consistent!